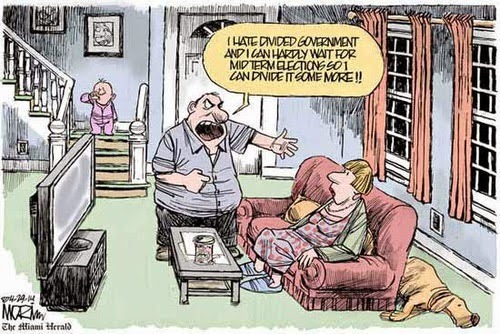 In a previous post, DWSUWF was bemoaning the state of the "divided government" meme, which barely rose above the blogospheric "noise level". 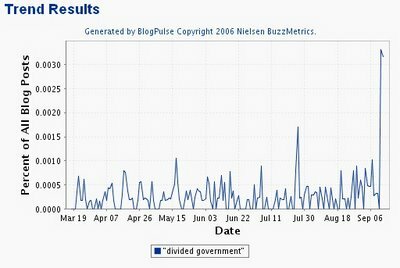 Since then we have seen several positive indicators, including these Blogpulse (static) and Technorati (dynamic) graphs. You've got to like the trend. The spikes just keep getting higher. This is a new high since the inception of the DWSUWF blog. The uptick this week is due to the Washington Monthly cover story, Ramesh Ponuru in the New York Times, and to a lesser extent the Stephen Slivinski and Norman Orntsein book tours. Reminder: The First "Carnival of Divided Government" will be posted here on Monday, September 18. 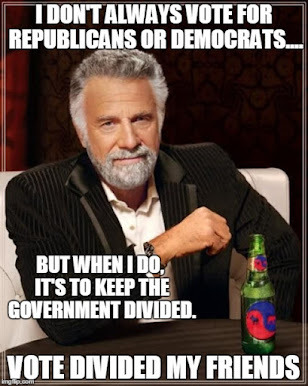 Send your "divided government" submissions, either via e-mail (see my profile) or the Carnival of Divided Government submission form.